The VL300 Short Adjustable Stand Mount EVS (Electronic Variable Speed) lathe has been designed to suit most wood turners. 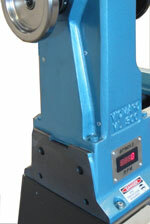 The electronic variable speed drive gives up to 200% torque on low rpm and it comes with a powerful 2.2kw motor . 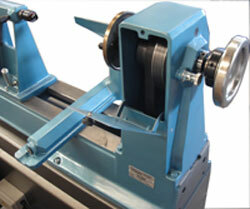 The three-step pulleys provide 3 ratios 1:1 for small to medium size work; 1:1.5 for medium to large work; and 1:3 for large work. The VL300 AMS EVS has been upgraded and now includes these following new features! Hindged headstock door for ease of use and a new erganomic toolrest. Also sold separately are a pair of stand shelf brackets. These brackets can be mounted on the back of the stand and allows for a timber shelf to be screwed on top.